The design, by Royal Canadian Mint engravers offers a single maple leaf in realistic detail. That detail is augmented by the reverse proof finish which is described as portraying brilliant raised elements on a frosted background. Each is issued as a celebration of the popular Maple Leaf Silver Bullion Coins also struck by the Royal Canadian Mint. Millions of the bullion coins are sold each year, however just 20,000 of these numismatic versions will be released. 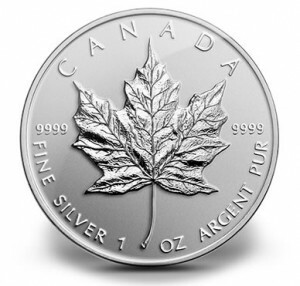 The Maple Leaf Fine Silver Coin is composed of one ounce of 99.99% pure silver. It features a diameter of 38 mm with a total gross weight of 31.39 grams. These coins are struck as legal tender of Canada and feature an associated face value of CAD $5. That face value is inscribed on the front along with 2014 and ELIZABETH II which all encircle the Susanna Blunt effigy of Queen Elizabeth II. Inscriptions on the reverse include CANADA, 9999 and FINE SILVER 1 OZ ARGENT PUR. For more information, or to purchase a 2014 Maple Leaf 1 oz Fine Silver Coin, please follow this link - 2014 Maple Leaf Fine Silver Coin to be taken directly to the Royal Canadian Mint website.